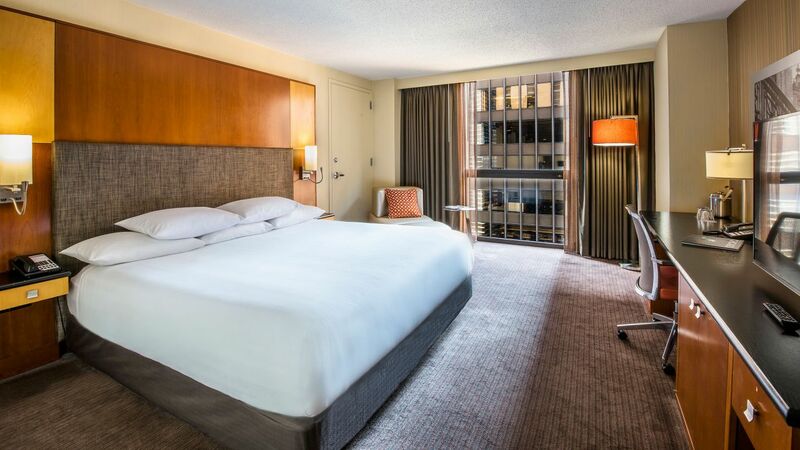 The largest hotel in Chicago, Hyatt Regency Chicago offers 2,032 rooms, including 123 suites, for contemporary lodging downtown. Marvel at views of the city, Chicago River, or Lake Michigan. 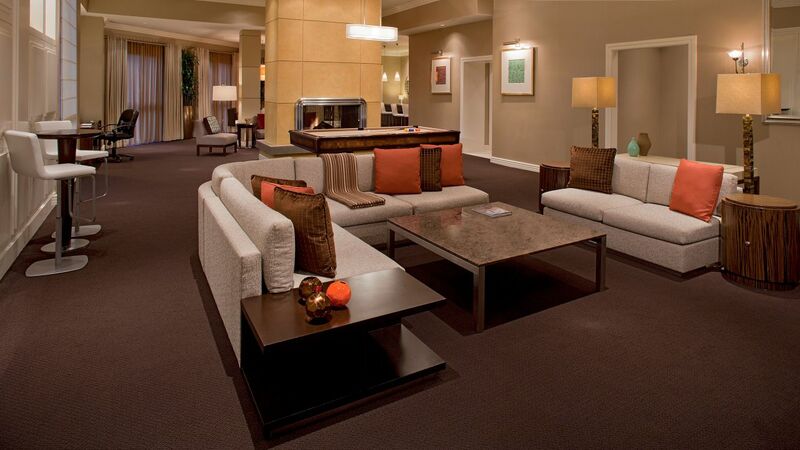 Opt for a Regency Club room for exclusive lounge access, including daily breakfast and all-day refreshments. 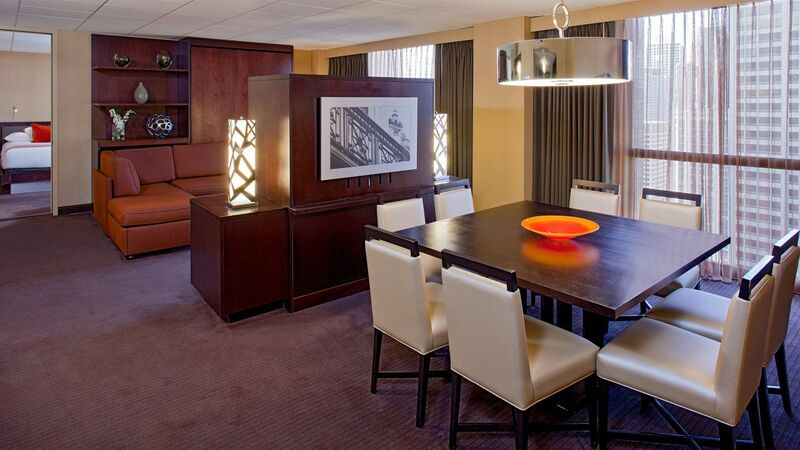 Upgrade to a suite for enhanced entertainment features including spacious dining and living areas. Host up to 150 guests in this 2,296-square-foot hospitality suite complete with one or two king bedrooms, two and a half bathrooms, living area, table for six people, pool table, and a fireplace. To book, please call the Suite Desk at (312) 565-1234 ext. 6680. This is a premium suite. See World of Hyatt program terms for upgrade eligibility. 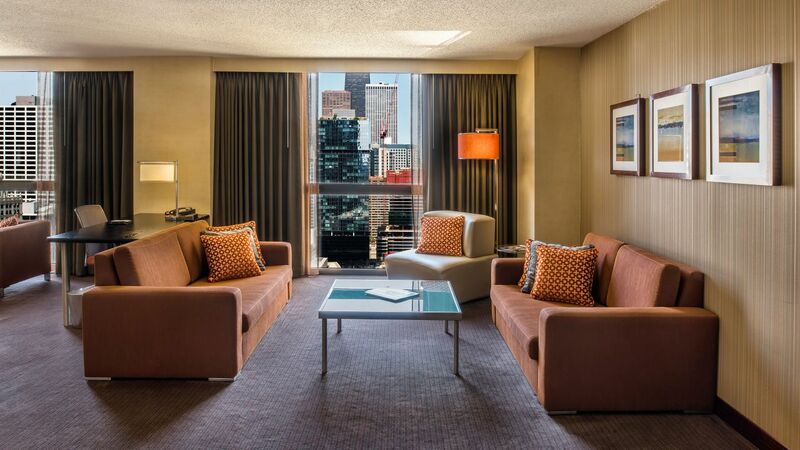 Kick your feet up and relax in this spacious suite with spectacular floor to ceiling views of the Chicago skyline. Enjoy this retreat away from home with contemporary furniture including a dresser, couch, armchair & footrest, and counter height table for four in this suite starting from 844 square feet. 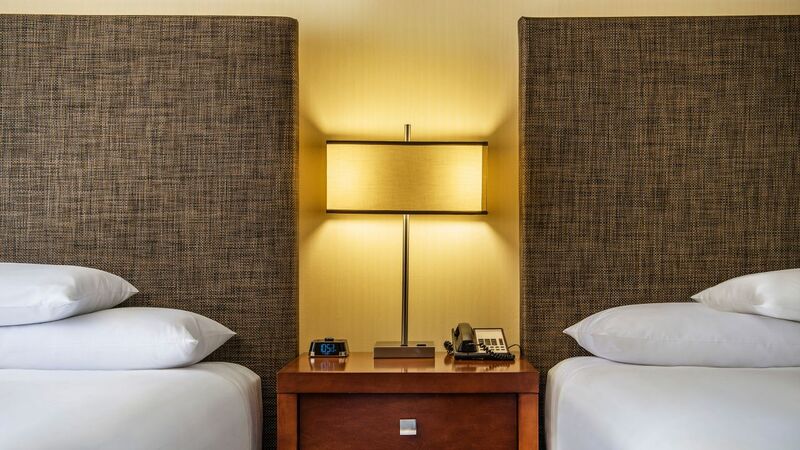 Rest and relaxation begins here. Treat yourself to 1,000 square feet of space in this suite featuring one king bedroom, a sitting area, a work space, and impressive views of the Chicago River or cityscape from floor-to-ceiling windows. This is a standard suite. See World of Hyatt program terms for upgrade eligibility. 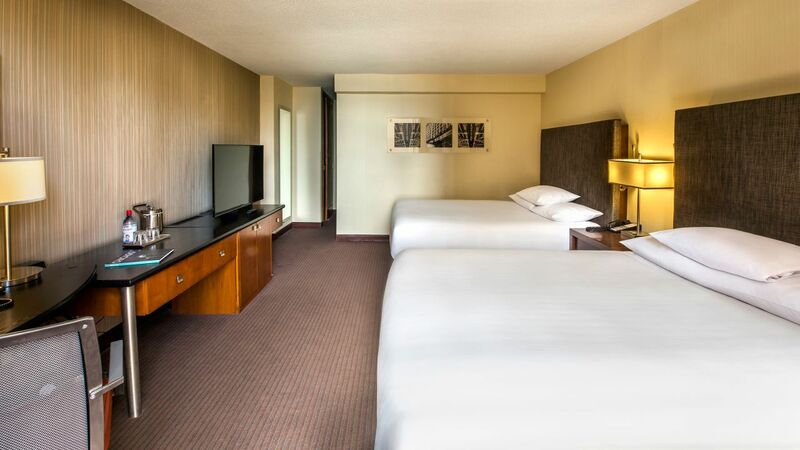 Get comfortable in this upgraded room with 420 square feet and two queen beds. 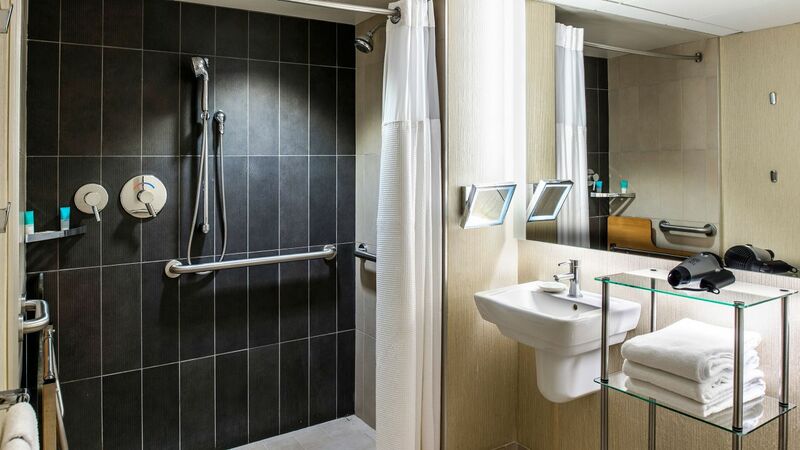 Relax on cozy lounge chairs or stay productive on a sleek workstation, with a deluxe bath and luxury amenities. This is a standard suite. See World of Hyatt program terms for upgrade eligibility. Upgrade your stay with over 1,000 square feet of space in this king bedroom suite boasting views of the Chicago River and floor-to-ceiling windows. Gather around the 8-person dining table or lounge in the spacious sitting area. 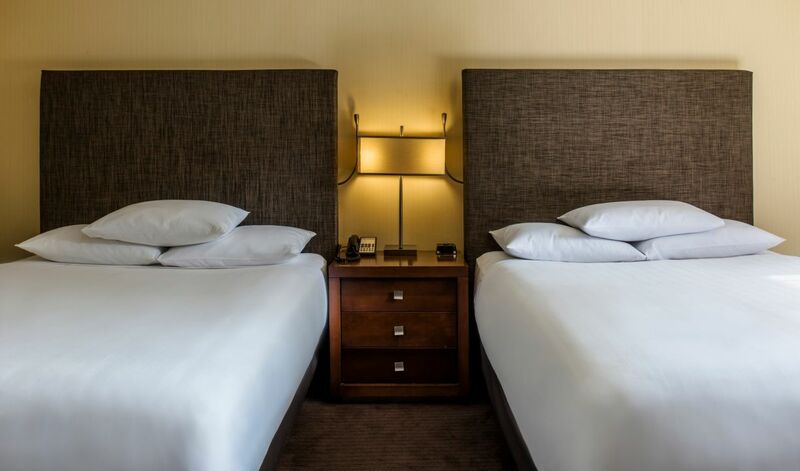 Retreat to this 351-square-room located on a high floor with views of the Chicago cityscape and a king bed. Lounge in the sitting area or get work done on the desk with ergonomic chair. Enjoy impressive views of the Chicago cityscape from this high-floor room featuring 351 square feet and two double beds. Freshen up in the deluxe bath or stay productive with an oversized workstation. 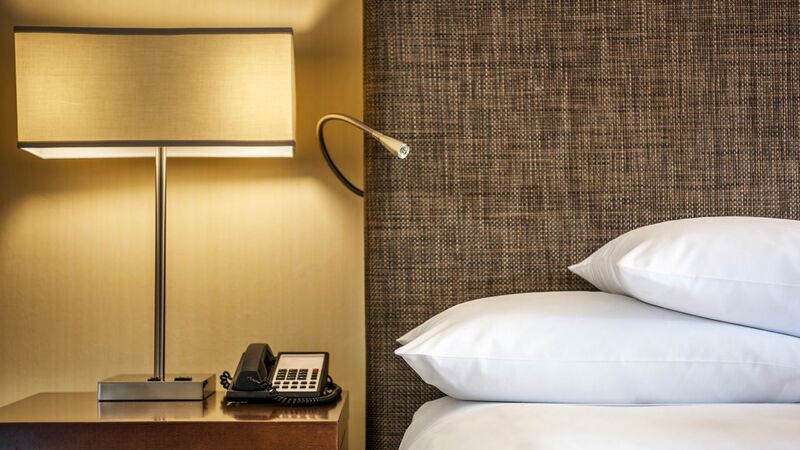 Wake up to Chicago city views in this 350-square-foot room featuring a king bed with an oversized work desk and an ergonomic chair. Access the Regency Club lounge and enjoy daily breakfast and all-day refreshments. Take in Chicago city views from this 350-square-foot room featuring two double beds and an inviting sitting area. Receive Regency Club access to enjoy the Club lounge with its continental breakfast, evening hors d’oeuvres and skyline views. Look out to spectacular views of the Chicago cityscape and the downtown from this 333-square-foot room with a king bed and oversized workstation. Relax on lounge seating by the floor-to-ceiling windows. 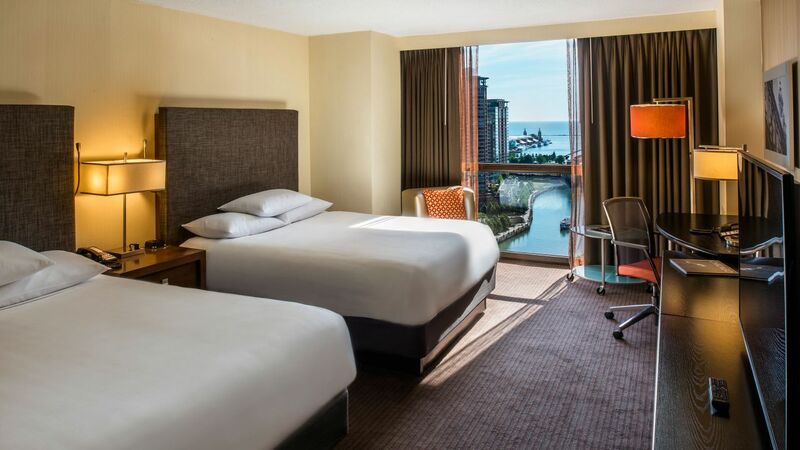 Revel in views of the Chicago River, Lake Michigan, or downtown Chicago in this 351-square-foot room with two queen beds. Relax on comfortable lounge seating near floor-to-ceiling windows or stay productive on the workstation. Get comfortable in this contemporary room featuring 337 square feet and a king bed. 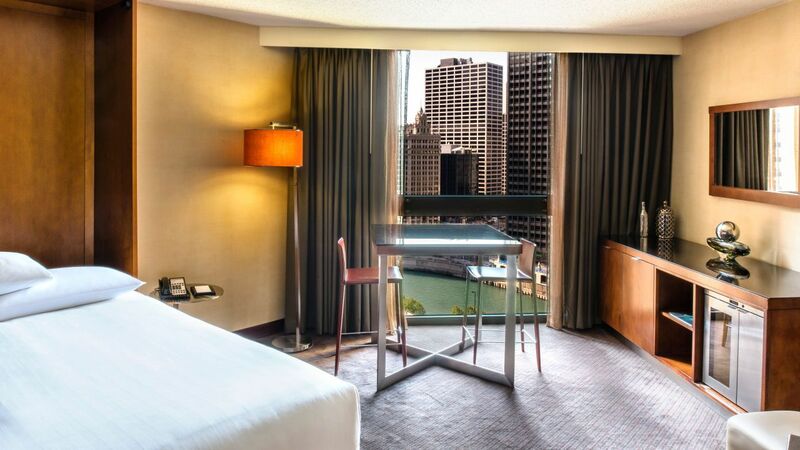 Take in views of downtown Chicago from floor-to-ceiling windows and get work done on the spacious desk. 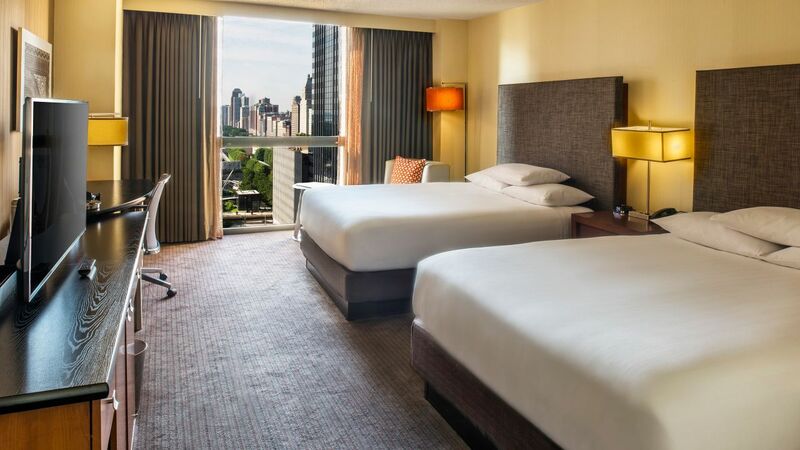 Delight in views of downtown Chicago or the Chicago River in this contemporary 300-square-foot room with a spacious workstation, lounge seating near floor-to-ceiling windows, and two plush queen beds with luxury bath amenities. Retreat to this 325-square-foot room with a luxe queen bed and floor-to-ceiling windows overlooking the Chicago cityscape or the river. Stay productive with a spacious workstation or get cozy on inviting lounge seating. 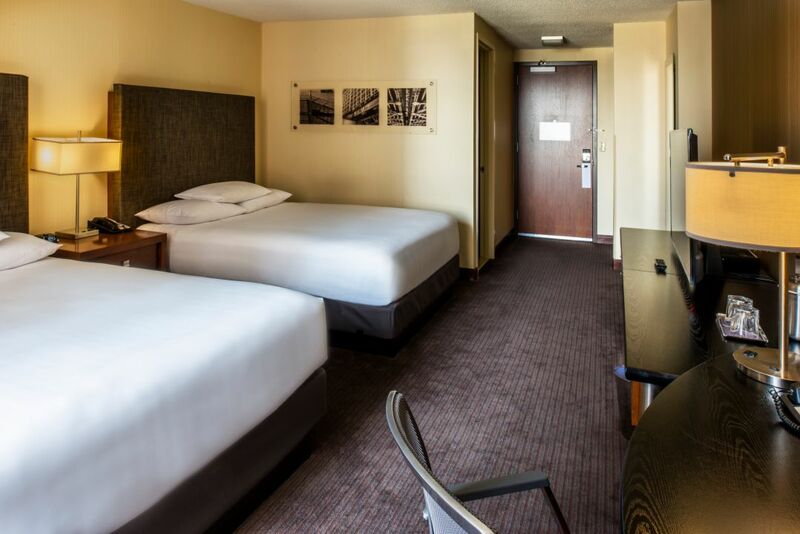 Stay comfortable in this 337-square-foot room with a plush king bed and ADA-compliant amenities, including an accessible bath with tub. Enjoy Chicago city views from floor-to-ceiling windows and an oversized workstation. 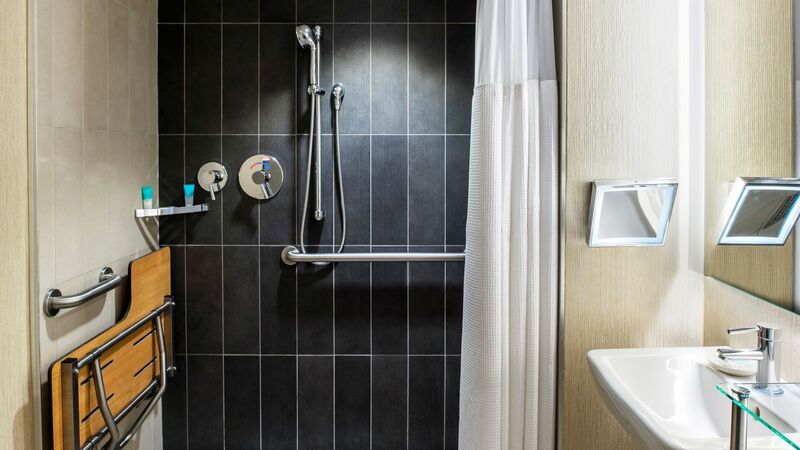 Relax in this 325-square-foot room with accessibility features including a deluxe bath with grab bars and a tub. 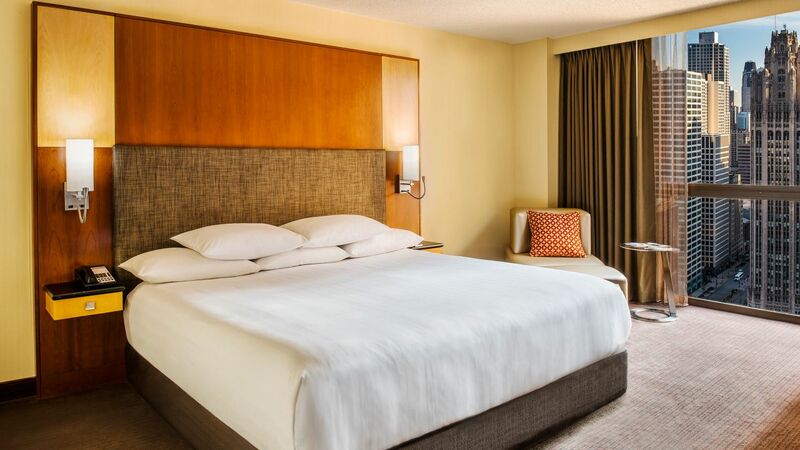 Sleep soundly on two plush queen beds and wake up to Chicago city views from floor-to-ceiling windows. Settle into this 337-square-foot room with accessible features including a deluxe bath with a seated shower and grab bars. 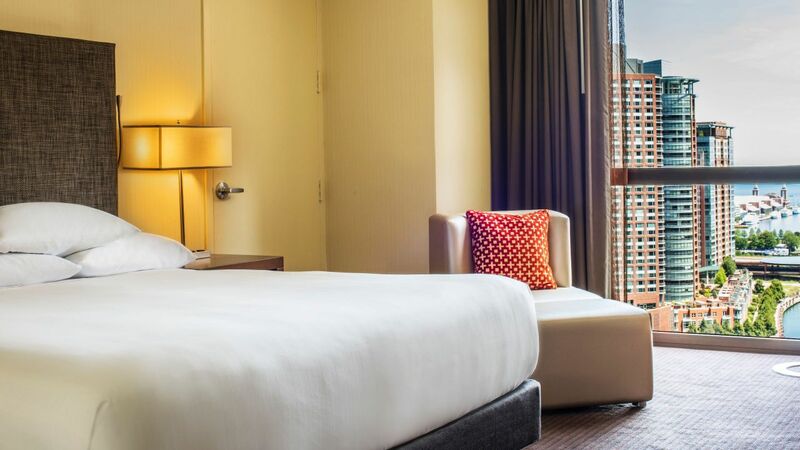 Relax on the plush king bed and enjoy views of the Chicago cityscape from floor-to-ceiling windows. Enjoy this ADA-compliant room with 325 square feet and two queen beds. 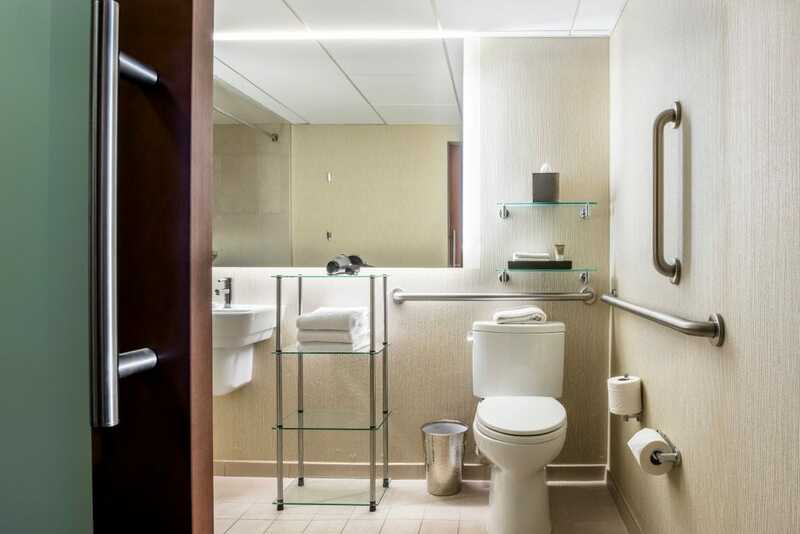 Stay refreshed in the deluxe bath with roll-in shower and enjoy Chicago city views from floor-to-ceiling windows.